CPA goal 2.0 is an auto-optimization technology performed according to the required price per conversion. The algorithm is able to predict what traffic slices are most likely to drive quality conversions at the desired price. It largely increases campaigns efficiency while saving your time you would normally spend analyzing and optimizing your results. The CPA Goal 2.0 technology is built atop of CPM bidding, and advertisers are paying for impressions, while the system is finding converting traffic according to the desired CPA and targeting. Once the campaign is up and running, the testing period starts. Testing period is the time required for the algorithm to collect necessary data in order to adjust an efficient CPM bid and help you meet the desired CPA Goal. It means that the system defines most effective CPM bid real-time, based on similar campaigns CPM bids and traffic volumes (number of impressions). Please note, that during the testing period, the cost of traffic per conversion may exceed the CPA Goal. After the end of this period, the cost will be close to the required CPA Goal. As was mentioned, CPA Goal 2.0 algorithm automatically line up the traffic that provides the desired conversion price. The appropriate traffic is being determined according to various factors, such as GEO, zone, OS version, browser etc. 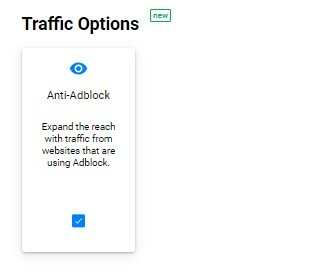 Due to this technology the system selects traffic precisely, there is no need to remove zones / traffic sources from the rotation (but you can launch the campaigns with pre-determined black list), which provides advertisers with optimal traffic volume. The price for traffic is being determined dynamically - in case of the absence or low number of conversions (regarding the price of traffic), the price and the amount of traffic will go down. If the trend of decrease continues, whole slices will be disabled, but in case of late conversions identified, the price will be recalculated and the traffic will start to deliver again. On the contrary, for the slices with high conversion rate the price of traffic will increase — this will allow the advertiser to get more traffic. The better your campaign converts (high CR), the more traffic your campaign is going to get. What are the advantages of the new model? How to launch CPA goal 2.0 campaign? Login to your PropellerAds Advertiser account or register if you don’t have any. Go to the “Campaigns“ page and click the “Create Campaign” button. 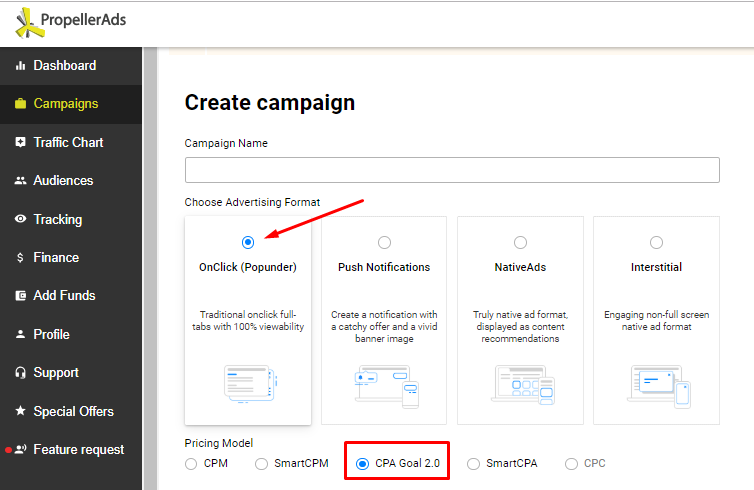 Enter your Campaign Name, choose onclick (popunder) ad format and CPA Goal 2.0 as the pricing model. 4. Fill in your Target URL. This is the landing page (or URL provided by a third party system) that the user will be directed to. 5. Choose Anti-Adblock Traffic Option. Expand the reach with traffic from websites that are using Adblock. 6. Choose Countries, Cities & Conversion Price. 7. Fill in the details about your campaign's Budget. Daily Campaign Budget - amount of money you’re willing to spend per day on this campaign. Total Campaign Budget - amount of money you are planning to spend on this campaign for the entire working period. If your campaign runs out of its total campaign budget, it stops. 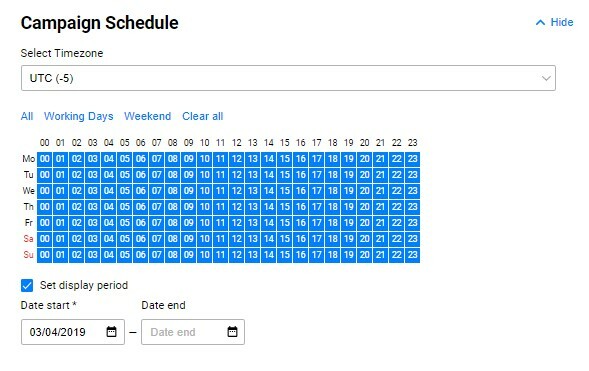 You can set the running period manually using the calendar or choose one of our presets: working days or weekends only. Also you can set up timezone for your campaign according to UTC and choose the dates of the display period (day start and day end). 9. Learn your audience and target your campaign properly so it will work cost effectively. 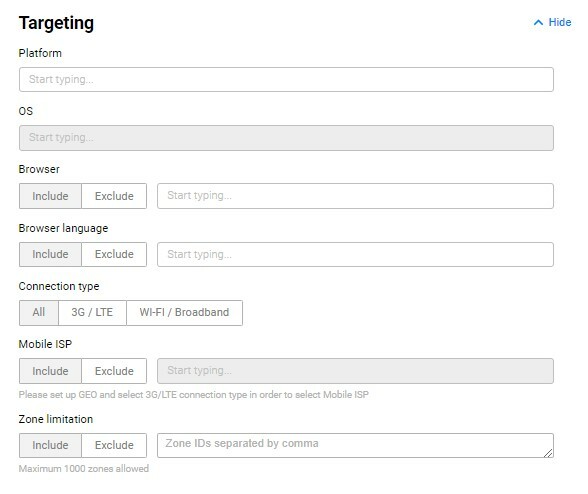 You can also include or exclude Ad Zones (if you already have collected some while/black lists). 10. After you’ve filled in the forms and set the targetings, click "Save and Start". Please note, that currently such pricing model is available for onclick (popunder) format only.